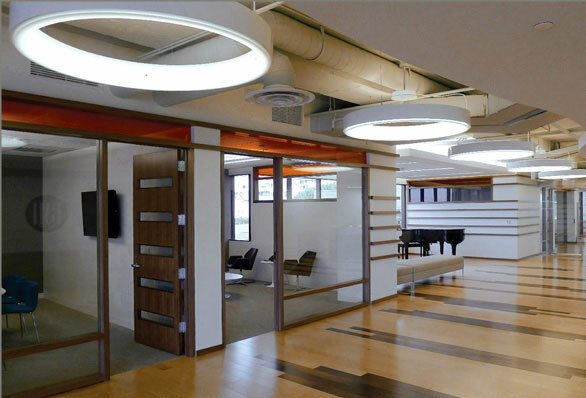 Available in 3, 4, and 5 ft. sizes, Delray Lighting’s Cylindro II fixture is a large-scale pendant luminary that works well in lobbies, reception areas, retail cashier/wrap counters, and other higher traffic spaces. Cylindro II coordinates well with contemporary design elements like exposed brick walls, wood rafters and joists, polished concrete floors, and exposed electrical, heating and cooling components. The smooth anodized aluminum outer shell is available in three finishes (silver, white, and black) and provides contrast to the inner white frosted acrylic diffuser, which produces soft, even up and down light. Cylindro II is available in two versions: Deco, with red, blue, warm white and cool white, or color sequencing LEDs. The Lux version features low or high output white LEDs, in 30, 35, and 40 degrees Kelvin. Supplied standard with adjustable aircraft and electrical cables, Cylindro II may be installed to accommodate any ceiling height or incline.